November sees the final flourish of autumn leaf colour before the usual gales finally strip deciduous trees and shrubs of their old foliage and they descend into dormancy to sit out the cold of winter. Have you ever stopped to think about why nature provides this colour burst? It is all to do with recycling! The chlorophyll that turns leaves green is not a stable product and it constantly breaks down in the leaf and needs to be replenished. When temperatures and light levels fall this process stops as the plant draws the basic nutrients back into storage (the woody parts that remain) to be re-used when growth resumes in the spring. This allows the stable pigments in the leaves to show through unclouded by the green. Leaves with more carotene turn yellow and those containing more anthocyanin turn red. This is the reason that most bright green leaves reveal carotene and turn the familiar yellow, orange or brown but trees and shrubs with leaves that are purple(ish) in summer often go a spectacular pillar-box red in autumn; the result of a higher anthocyanin content. 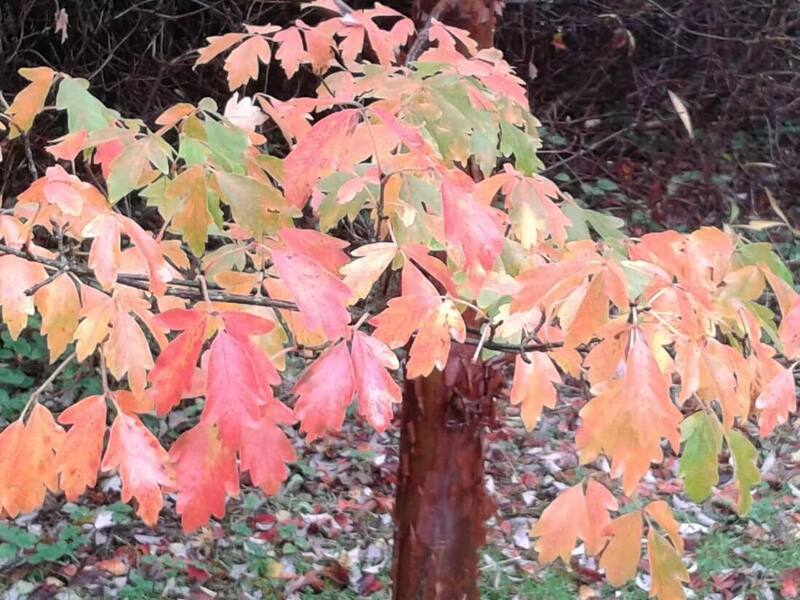 This Acer griseum gives double value with fabulous leaf colour in autumn and the rich textured bark all winter. Trees: Stewartia pseudocamellia, Liquidambar styraciflua especially good are L.s. ‘Worplesdon’ and L.s. ‘Lane Roberts’ and Amelanchier lamarckii (RHS AGM). Shrubs: Enkianthus campanulatus and E. perulatus both have an RHS AGM. Euonymus europaeus is the native Spindle with red berries as well as coloured autumn leaves. Physocarpus opulifolius ‘Diablo’ has deep purple leaves that turn red and earn its space even in a small garden. Take some time to look around at this year’s autumn show and plan your own great display for next October.